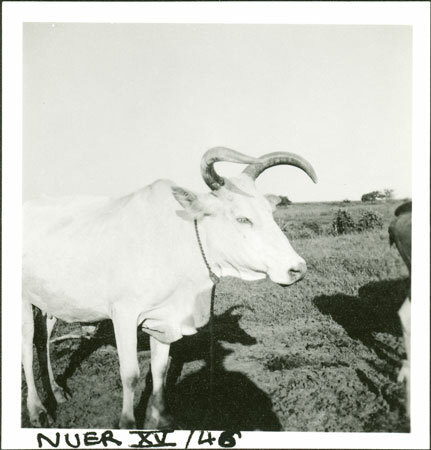 A portrait of a tethered white cow with forward facing horns. In contrast to his two earlier fieldwork visits when photographing cattle was viewed suspiciously by the Nuer, Evans-Pritchard took numerous record images of them during his later field trips. Note on print reverse ms pencil - "64 2 A158" & print front border ms ink - "NUER XV/46"
Morton, Chris. "Nuer cow" Southern Sudan Project (in development). 03 Jan. 2006. Pitt Rivers Museum. <http://southernsudan.prm.ox.ac.uk/details/1998.355.723.2/>.